Getting pallet loads across rough terrain with a standard pallet jack is nearly impossible. To help you solve this problem, HOF Equipment Company carries a big selection of Vestil All Terrain Pallet Jacks specifically designed to work in outdoor environments moving pallets and skids over rugged terrain. These jacks have oversized pneumatic or foam filled tires, adjustable forks, and a wide straddle that allows a pallet to fit between the outriggers. 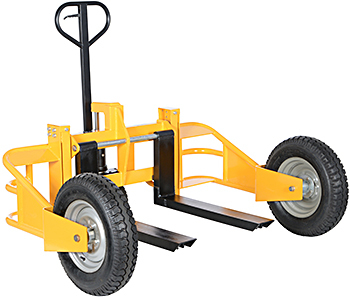 Our selection of all terrain pallet trucks includes manual push and lift models that may also be ordered with an optional tow bar for pulling behind a tractor or ATV. We also carry rough terrain pallet trucks that have fully powered drive and lift capabilities. Gasoline and propane powered models are available. HOF Equipment Company aims to make your all terrain pallet jack purchase as easy as possible. Give us a call or check out our selection on our website today!